Combine all ingredients for crust in a bowl evenly. Press mixture into a 9″ springform pan and up the sides, about one inch. In bowl fitted with paddle attachment beat cream cheese and sugar together until combined and smooth. Add in egg yolks and beat until mixture is just combined, scraping sides as necessary. Add in flour, sour cream and lemon zest and mix until smooth. Pour mixture over prepared crust. Bake for 75 minutes. Then turn off oven and leave cheesecake in the warm oven with the door closed for 4 hours. Finally, remove it from oven, run a knife along the edges to loosen from pan and chill for 6 hours, or overnight. Whisk 6 reserved egg whites with sugar. Place over a double boiler and stirring constantly heat mixture until it reaches 140° on candy thermometer. Pour mixture immediately into bowl of stand mixer, fitted with whisk attachment and beat for 10 minutes, until glossy and stiff peaks form. 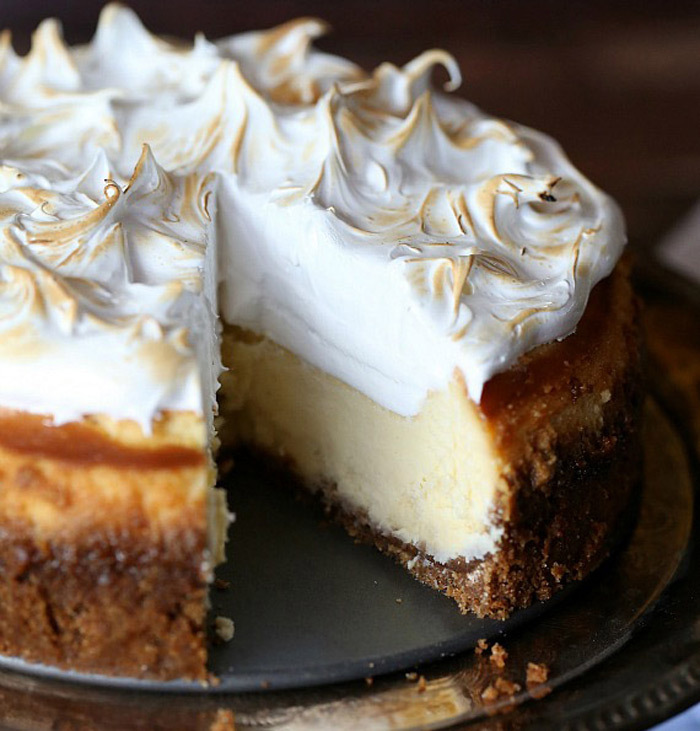 Spread the meringue over chilled cheesecake and with kitchen torch lightly brown the tops of the meringue. if you would like to amp up the flavor of lemon in this recipe, you can add another tablespoon of lemon zest. Store covered in refrigerator for up to 3 days. recipe adapted from Amazing Cakes Magazine.